Bangalore-based Flightraja Travels Pvt. Ltd. (Via), which has broadened its business strategy from being a travel-specific B2B firm to e-commerce with the launch of a deals sub-site, has now revealed further details of its expansion plans. Via Deals More, that offers products and services in consumer electronics, food and beverages, travel and lifestyle in 15 cities, is scaling up to reach 100 towns and cities in the country by October as it attempts to reach its target of 10,000 transactions per day in the next two quarters. The firm recently added Ludhiana, Lucknow and Coimbatore in its geographic coverage. Via runs ticketing portal Via.com and a network of 50,000 offline and online travel partners in India. It is backed by Indo US Venture Partners and Sequoia Capital and is now learnt to be raising $100 million to expand to more countries. Its travel network currently reaches users in 2,000 cities. 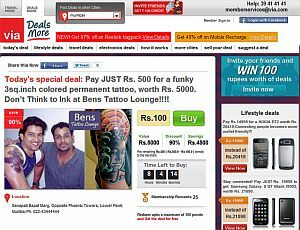 There are numerous group buying and daily deal sites in India - Rediff's Deal Ho Jaye, Times Internet (Indiatimes)'s Timesdeal.com, Snapdeal.com, Dealsandyou.com, Mydala.com, Koovs.com, Groupon India (Crazeal.com) and various others. On the global front, Facebook tested deals for four months before deciding to not launch it. Google has launched a beta version called Google Offers for certain cities in US. Groupon and LivingSocial continue to face off as the top daily deal sites globally.